Microsoft has updated its Surface Book devices, two years after the original devices launched. After such a long gap Microsoft could deliver multiple significant upgrades with this latest generation, its Surface Book 2 devices. 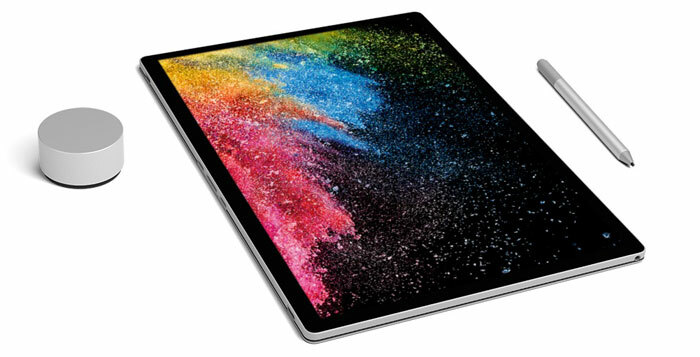 Furthermore, the design team behind the Surface Book 2 said they “made no compromises building the most powerful Surface laptop ever,” and refer to the attractive new hybrid Surface Book 2 device as “Beauty and the Beast”. Purchasers can choose configurations built around a 13.5-inch 3000x2000 pixels (from 1.53kg) or 15-inch 3240x2160 pixels (1.9kg) form factor. Both these offer 10-point multi-touch pen-friendly screens. The fastest processor available in the Surface Book 2 is the 8th Gen Intel Core i7-8650U quad-core processor, 4.2GHz Max Turbo. The 13.5-inch model also provides the choice of a 7th Gen Intel Core i5-7300U dual-core processor, 3.5GHz Max Turbo. Only the entry level i5 model relies upon integrated graphics, HD Graphics 620. On the 13.5-inch i7 model you get an Nvidia GeForce GTX 1050 discrete GPU 2GB GDDR5 graphics memory. Moving up to the 15-inch Surface 2 and the GPU equipped is an Nvidia GeForce GTX 1060 discrete GPU 6GB GDDR5 graphics memory. Other important specs include; between 8 and 16GB of 1866Mhz LPDDR3 RAM, 256GB, 512GB, or 1TB PCIe SSD storage, front and back cameras with Windows Hello support, HW TPM 2.0 chip, dual microphones, stereo speakers, Wi-Fi 802.11 a/b/g/n/ac, BT 4.1, battery life of up to 17 hours of video playback. There are built-in sensors for Ambient light, Proximity, Accelerometer, Gyroscope, Magnetometer. Ports include 1 x USB-C, 2 x full-size USB 3.1 Gen 1, a 3.5mm headphone jack, 2 x Surface Connect ports, Full-size SD card reader, and power in. The Surface power supply includes an additional USB-A charging port. Physical power and volume adjustment buttons are present. As is usual for surface devices these Surface Book 2 machines are hewn from magnesium alloy. If you’ve used the original Surface Book and found the hinge mechanism to be a little wobbly, perhaps when typing, the new revamped fulcrum hinge is said to be sturdier then before, yet makes detaching and converting to a tablet easier. The smallest new device is the i5-powered 13.5-inch Surface Book 2 which is up to 2mm thinner than the i7/GeForce GTX 1050 version at 312 mm x 232 mm x 13 mm-23 mm (1.53kg) rather than 312 mm x 232 mm x 15 mm-23 mm (1.64kg). The 15-inch Surface Book 2 measures 343 mm x 251 mm x 15 mm-23 mm and weighs 1.9kg. The full tech specs list for both Surface Book 2 sizes is available here. 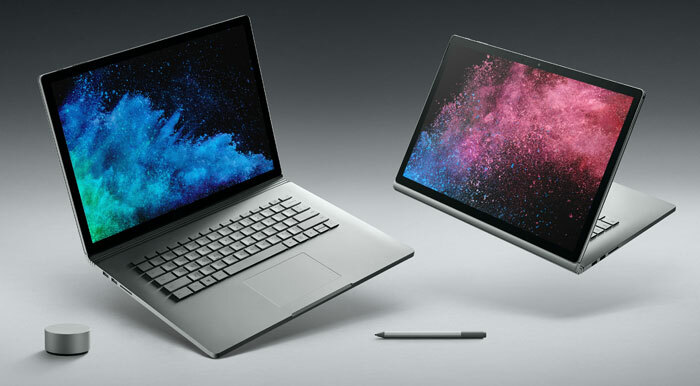 In its blog post about the new Surface Book 2 machines Microsoft compared them to the latest Apple MacBook Pro machines, claiming up to twice the computational power, 70 per cent better battery life, and up to 45 per cent more pixels on the impressive screens. 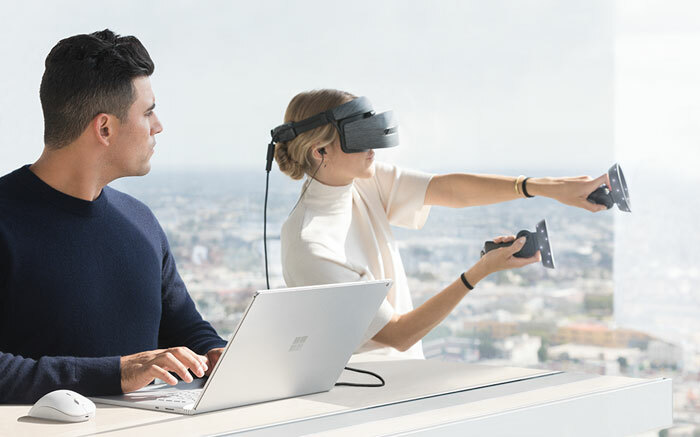 As well as being great for creators, offering “the best of Office and Windows,” Microsoft said the new convertibles could deliver “great PC gaming and Windows Mixed Reality experiences.” The machines with discrete GPUs can “handle the most popular PC games at 1080p and 60 FPS,” and built-in Xbox One Wireless support on the 15-inch model may be an attraction for some. The Surface Book 2 will be available for pre-order beginning 9th November in the US and some other world markets. Product delivery is expected from 16th November onwards. Microsoft’s i5 powered 13.5-inch Surface Book 2 will start at $1,499/£1,499, with the most powerful 15-inch configuration at $2,499. Looks great - and if the battery claim holds up I think this will be my next laptop. I've got up to £3k to drop a new laptop device later this year and was hoping the new SB2 would be good enough to finally justify the spend…looks like it might be. I wonder if it's possible to exchange an old model I have + £200 or so to upgrade to one of these. They do that with the surface pro models. Good to see the Surface Book line is alive and kicking. It looks like a decent upgrade but I'll wait since my current Surface Book is still going strong. Meh. Max 16GB RAM. Not interested then.